The Yellowhammer has so endeared himself to Americans from Florida to Alaska that they have given him 132 local names. 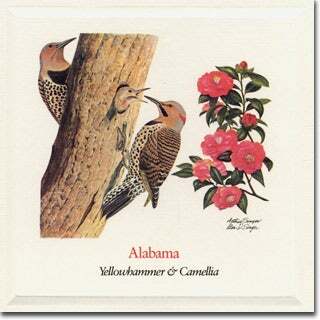 Alabama adopted the Yellowhammer as the state bird because her soldiers marched off to the Civil War with feathers of the Yellowhammer in their soft felt hats. More widely known as the Yellow-shafted Flicker, both sexes carry a red crescent on the name. In spring, this colorful drummer sends courting messages on trunks and tin roofs, and soon pairs off to find the ideal nest. In its wild state the Camellia bears a single red flower with only five petals, but under man's care it has become a double flower with many petals. Alabama's splendid variety is a large, bright crimson flower with deep veined, rounded petals. Camellias have very short stalks which grow almost directly from the branch, like waxen rosettes among the glossy, evergreen leaves. This shrub-like tree sometimes grows as high as forty feet, and, as it is not naive to this country, also grows wild in China, Japan, and North India. 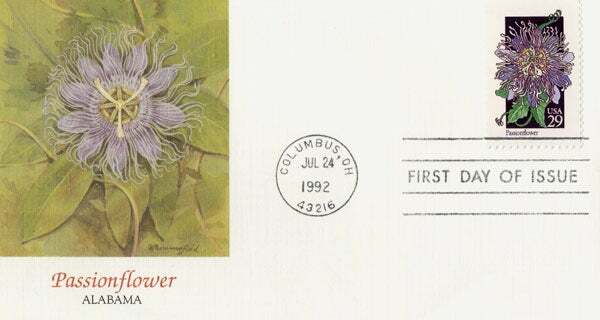 Alabama Wildflower - Passionflower Art from the 50-stamp series, State Birds and Flowers, issued April 14, 1982 simultaneously in all state capitals.